Triple Crown winner American Pharoah has been named best racehorse of 2015. Trained in the United States by Bob Baffert, American Pharoah's achievements were honoured at the Longines Awards in London. American Pharoah was the first winner of the Triple Crown - Kentucky Derby, Preakness Stakes and Belmont Stakes - since Affirmed in 1978. France's Prix de l'Arc de Triomphe, won by Golden Horn, took the award for world's best horse race. American Pharoah was given a top rating of 134 by a team of international flat racing experts after a season which culminated with victory in the Breeders' Cup Classic. "He did it all," said Baffert. "I've had a lot of talented horses, but he just kept bringing it." 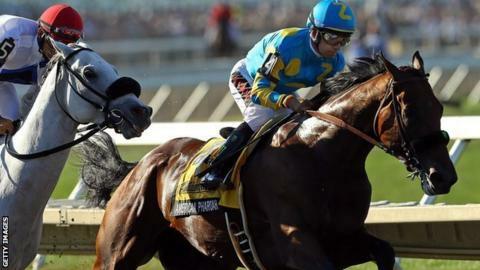 Jockey Victor Espinoza described his mount as "a once-in-a-lifetime horse to ride", while owner Ahmed Zayat said the horse was "cuddly, lovable and brilliant". American Pharoah became a household name in the US and finished top of a 'Sportsperson of the Year' poll carried out by Sports Illustrated magazine. The horse has been retired for a breeding career at Ashford Stud in Kentucky, where he commands a fee of $200,000 (£140,000) a time. Golden Horn, whose Arc triumph followed a series of victories under jockey Frankie Dettori, including the Derby at Epsom, was second in the awards on a 130 rating. Shared Belief and Treve were ranked joint third on 126.